Yesterday I spoke with Jonathan Cheng, a Seoul-based staff reporter for the Wall Street Journal, about the Active-X issue discussed in my previous and numerous earlier posts. His article, published today, provides a good overview of the current status of Active-X related regulations in Korea and their possible imminent change. I also appreciate that he used one of the more important points we discussed when quoting me. Microsoft Active-X issue in Korea Near Resolution? President Park Geun-hye held a deregulation forum last week at the Blue House and, not surprisingly, one of the hot topics was the continued requirement by many e-commerce sites and financial institutions that users download and install Microsoft Active-X controls to complete their online transactions. South Korea's heavy reliance on Microsoft software is the subject of many earlier posts on this blog, so the discussions at the deregulation forum obviously caught my eye. The Korea Joongang Daily carried an informative report today that, among other things, reported the results of a nationwide poll conducted by the Federation of Korean Industries. 78.6 percent of the respondents in the poll wanted the use of Active-X to be discontinued, while only 6.7 percent opposed the idea. 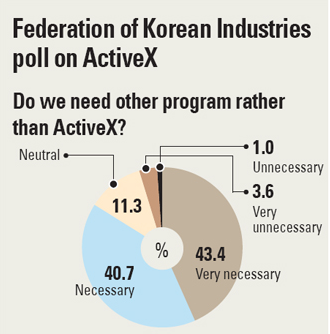 As shown in the accompanying graphic, when asked whether Korea needs another program, over 80 percent said it was "necessary" or "very necessary." Active-X was designed by Microsoft many years ago, without any real consideration of today's security concerns. Consequently, Microsoft itself acknowledged the problem years ago and its own web site contains quite a detailed explanation of the security problems Active-X can pose. The FKI poll also reported some interesting data that shows Active-X interferes most of all with the consumer experience of online shopping and online banking, but is also viewed as a source of "discomfort" in other transactions. The second graphic gives a breakdown of responses. According to the Korea Joongang Daily article,"Choi Moon-ki, the minister of science, ICT and future planning, said in the ministry’s workshop on Saturday that it will provide an online environment and online authentication certificate without ActiveX. The ministry is expected to work closely with the Financial Supervisory Service and Financial Services Commission to find solution for ActiveX problem." Nearly six million users of SK Telecom's mobile network were surprised this week when the network crashed and left them without service for about six hours. This almost unthinkable occurrence was, of course, widely reported in the local press. As noted by the Korea Joongang Daily, the crash did not occur because of hacking or some type of cyber attack. Instead, as reported by the newspaper, it occurred "Thursday after a piece of equipment that verifies the locations of subscribers malfunctioned. The equipment, called Home Location Registration (HLR), is the main database of permanent subscriber information for a mobile network. The HLR was disrupted at a peak traffic time and could not distinguish SK Telecom users to transmit signals. According to the company, it only took 24 minutes to repair the equipment. But the blackout of services created a sudden rush of traffic as phone users tried to get back online, which overwhelmed the networks." Forthcoming Washington D.C. conference on "The Korean Experience: Lessons for LAC Development"
I've accepted an invitation to speak on the topic of Korea's leadership in global ICT development at a May 13-15 international conference, "The Korean Experience: Lessons for LAC (Latin America-Caribbean) Development, sponsored by the Korean government Ministry of Strategy and Finance and the Institutions for Development Department of the Inter-American Development Bank (IDB) It will be held at IDB headquarters in Washington, D.C. The European Union has just published its annual Innovation Union Scoreboard report, which includes an index measuring innovation in EU countries and benchmarks them against other countries around the world. 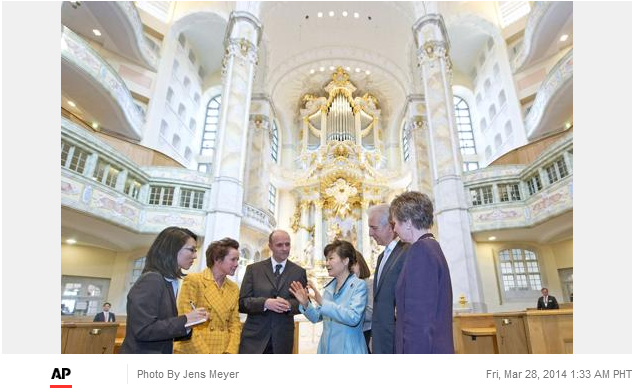 As reported in the local press, including the Korea Joongang Daily, Korea this year topped the rankings,outperforming the United States, Japan, European Union and Canada. 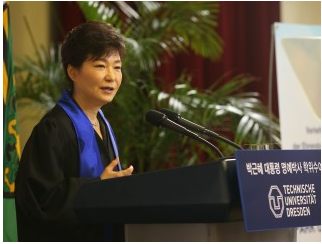 This new report will no doubt be welcomed by many here in Korea, both in the private sector and government, given the centrality of innovation to the overall goal of the Park Geun-hye administration to develop a "creative economy." 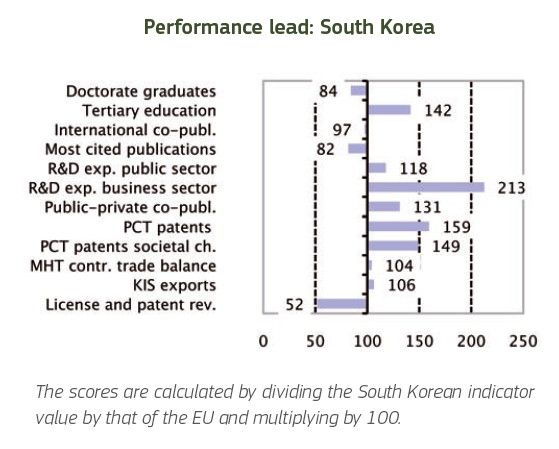 However, it should be kept in mind that this is only one of several international measures of innovation and its primary value may lie in what it says about how the European countries view Korea. A new government poll showed that four out of five primary and secondary school students in Korea own smartphones and an increasing number of them are using their devices to view adult content. The Ministry of Gender Equality and Family surveyed 10,062 students aged between 10 to 17 around the country. As shown in the accompanying table from the survey (click to see a full size version), if feature phone ownership is included 91.5 percent of all the students surveyed owned mobile phones. That compared with only 68.2 percent in a survey taken in 2007, before the arrival of smartphones in the Korean market near the end of 2009. Among elementary school students, the percentage of smartphone owners was 72.2 percent. As reported by Yonhap News, "About 16.1 percent of the students with mobile phones said they have used their phones to send or receive videos, photos and other content for adults over the recent year. The figure is up three times from 4.5 percent in 2011. About 25 percent of those surveyed said they have accessed adult content more than once a month through smartphones, Internet and various other media. The corresponding share was 18.6 percent among elementary school students while 6.9 percent were found to have accessed adult content at least once a week."